Social work is a life-affirming and rewarding career field. It’s also one of the fastest growing in the nation, with over 100,000 people expected to enter the field in the next seven years. In spite of this, many social workers’ salaries tend to lag behind that of other helping professions like nurses, police, and high school teachers. This year, during Social Work Month, the National Association of Social Workers (NASW) wants the public to pay more attention to this issue and spark a conversation on ways to end such pay disparity. This year’s theme is “Elevate Social Work.” The theme has two meanings: We not only want to educate the public about how social workers uplift and empower members of our society, but also to let the public know that they must do more to support the field. We are using a variety of tools to do this. One is an infographic that sets out the facts. The demand for social workers is growing as our nation grapples with issues such as hunger, income equality, affordable housing, immigration, and the need for more mental health services. At the same time, the salary levels for social workers could improve. The infographic offers data on the average salary level of social workers by college degree and what sectors tend to pay social workers more. 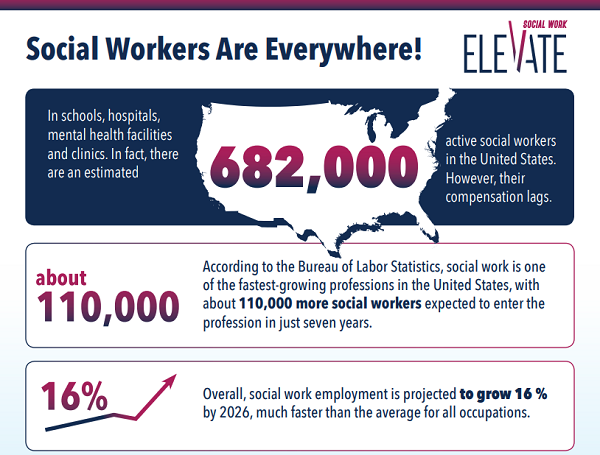 NASW hopes social workers and their allies can use the infographic to illustrate the case for higher social work pay. In addition, we are offering a podcast series that features conversations with social work experts about the salary issue and what social workers can do to address it. Guests include financial advice guru Suze Orman, who earned a bachelor’s degree in social work; past NASW New York City Chapter President Robert Schachter, who helped lead a campaign in the city to boost salary levels; and Morgan State University Professor Michael Sinclair, who was New Jersey state coordinator for the Social Work p.r.n. national staffing service. We urge folks to listen to the podcast series and leave their comments on NASW’s Social Work Blog. NASW will be using these comments to weigh the next steps in addressing the salary issue. Lastly, we have released a video public service announcement that looks at what our nation would be like if there were no social workers around. We hope social workers and their friends will share the video on their social media channels and ask their local TV stations to air it. The video will also be aired as an advertisement on YouTube throughout Social Work Month. It is important to note that while NASW cannot act as a labor union and collectively bargain for social work salaries, we are working to improve those salaries in other ways. For instance, NASW supports the Improving Access to Mental Health Act, which offers clinical social workers more adequate Medicare reimbursement rates, as well as other legislation that would prompt our nation to invest more in its social work personnel. Several NASW chapters have also supported initiatives for states to hire more school social workers, give social workers raises, or require government agencies to hire only qualified, licensed social workers for certain positions. Of course more needs to be done to elevate the social work profession, and we know it will take all of us to do that. So during Social Work Month, take time to learn more about our campaign. Let us know what you think should be done to promote social work! The views, information and opinions expressed herein are those of the author; they do not necessarily reflect those of the Council on Accreditation (COA). COA invites guest authors to contribute to the COA blog due to COA's confidence in their knowledge on the subject matter and their expertise in their chosen field. Greg Wright is the public relations manager for the National Association of Social Workers (NASW), the largest membership organization of professional social workers in the world. Greg previously worked in public relations for the National Association of Manufacturers. A graduate of the University of Maryland, College Park, Greg had a long career in journalism, working for Gannett News Service/USA Today, Knight-Ridder Financial News, and Dow Jones News Service. Greg’s work has appeared in Essence Magazine, the Society for Human Resource Management, the Journal of Commerce, and PG Suite Magazine.